Communication was very good. We were contacted multiple times leading up to our stay to remind us of date/time as well as directions and lockbox code. We even received a phone call making sure we checked in okay. This was exceptionally good customer service. Thank you for our amazing stay. Very peaceful, relaxing. Great memories. Fun time bonding with my family. A well needed vacation, coming back into nature. Thanks for everything! This is great cabin. Nice location and nicely furnished. Also, this is very close to the deep creek area of GSM it is about 30-40 minutes from the main area/entrance of the park. Very helpful from beginning to end. The information sent for our stay was very helpful. We have friends that live there, they recommend your company and had activities planned for us. Wonderful place that is tucked away on a mountainside. Cabin is peaceful, but also close to lots of great activities. It was great to sit out in the hot-tub on the deck as the mist rose over the mountains in the morning and hear the birds singing. Bryson City is a fun little town with some good amenities, beer and food. Our family of 4 were here to Visit with our cousins and Aunts, Uncle and Grandmother. What a peaceful spot hidden gem or a cabin. So many birds in the morning and the mist rising off the Mountains make it so lovely. Wonderful place to unwind and take life slow. The cabin was just right. Everything we needed and nothing we didn't. We had a super time- no real complaints - We enjoyed several activities in the area as well! Thank you for your hospitality. Great place- Cute and spacious. Enjoyed the amazing view and the hot tub. Absolutely loved the cabin. IT was a great place for our first family vacation. The cabin was great plenty of room inside as well as the outside. Loved the kitchen and dining room all open to visit with everyone. My friends and I drove here to have a great time and we definitely did. Many memories were made. 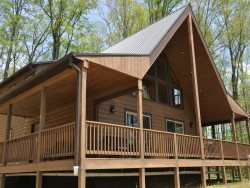 My husband and I rented the Mountain Aire cabin for a four day getaway. We were looking for something with a view and hot tub close to Bryson City. It was Perfect! The cabin was clean, well - appointed, the hot tub was sparkling and a huge, the view was [email protected] We enjoyed sitting out on the porch and in the hot tub here was a great breeze which seems to always be just right. We we'll go back for sure - in fact we plan on staying for a week next time and do some hiking! It is so close to all of the trail heads. The ones that I talked to were great. I love the rental company, we are return renters and we have been pleased in the past with our properties. We had a blast. Just perfect for our three generations ages 3 to 90. First Polar Express for us all. We hope to be back next year. The team has always been very friendly and knowledgeable. You have staffed your company with the "A" team. Very knowledgeable and extremely pleasant. Congrats on a job well done. Our first visit to the Smoky Mountains! We had a fantastic view. Our Children enjoyed the spacious cabin and all the board games. We loved grilling out and making smores in the camp fire and relaxing in the hot tub. We hope to come back again in the future for our boys! An amazing time!!!! Had a fabulous vacation here. We are planning a trip back in October for our honeymoon. Love the cabin. Very tastefully decorated. Stopped in the office for a visit - very friendly and helpful. Really enjoyed the friendly conversation. Beautiful cabin with all of the amenities you could want. We enjoyed relaxing in the hot tub. Perfect cabin to retreat to after a long day of exploring. I didn't actually get to meet any of the staff, but the folks I talked to on the phone were very pleasant and helpful.